Airbus Defence and Space has recently handed over the first of ten A400M New-Generation airlifters ordered by the Turkish Air Force, which is the second customer to receive the A400M. The Turkish Air Force formally accepted the aircraft from Airbus Defence and Space at the A400M Final Assembly Line in Seville, Spain. A further ceremony will take place in Turkey at a later date. Following the contractual transfer of title, the aircraft, which is the third production A400M, will be flown to Kayseri Air Base in central Turkey where it will initially be used for training. 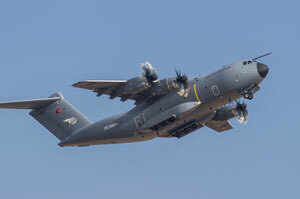 In Turkish Air Force service the A400M will replace the C-160 Transall offering a dramatic increase in air transport capability to the Armed Forces. The A400M is an all-new military airlifter designed to meet the needs of the world’s Armed Forces in the 21st Century. Thanks to its most advanced technologies, it is able to fly higher, faster and further, while retaining high maneuverability, low speed, and short, soft and rough airfield capabilities. It combines both tactical and strategic/logistic missions. With its cargo hold specifically designed to carry the outsize equipment needed today for both military and humanitarian disaster relief missions, it can bring this material quickly and directly to where it is most needed. Conceived to be highly reliable, dependable, and with a great survivability, the multi-purpose A400M can do more with less, implying smaller fleets and less investment from the operator. The A400M is the most cost efficient and versatile airlifter ever conceived and absolutely unique in its capabilities. The A400M New-Generation airlifter had earlier successfully completed one of the most important elements of its continuing military flight-test programme – the first phase of airdrop trials. Flying over the Fonsorbes drop zone near Toulouse, an A400M development aircraft dropped a range of different loads by parachute during 11 flights over a two-week period. In total it dropped 26 platforms and containers weighing from 255kg to 4 tonnes using the Ramp Aerial-Delivery System (RAS-wedge), and 11 bundles weighing from 15kg to 320kg using the paratrooper doors. Airbus Defence and Space is a Division of Airbus Group formed by combining the business activities of Cassidian, Astrium and Airbus Military. The new Division is Europe’s number one Defence and Space enterprise, the second largest space business worldwide and among the top ten global defence enterprises.